(Pictured in the center) Ms. Wheelchair Florida 2018 Shavaughn Barnes and (from the right) DPT students Brandi Black and keynote speaker Erin Waterman attended the Disability Advocacy Assembly. 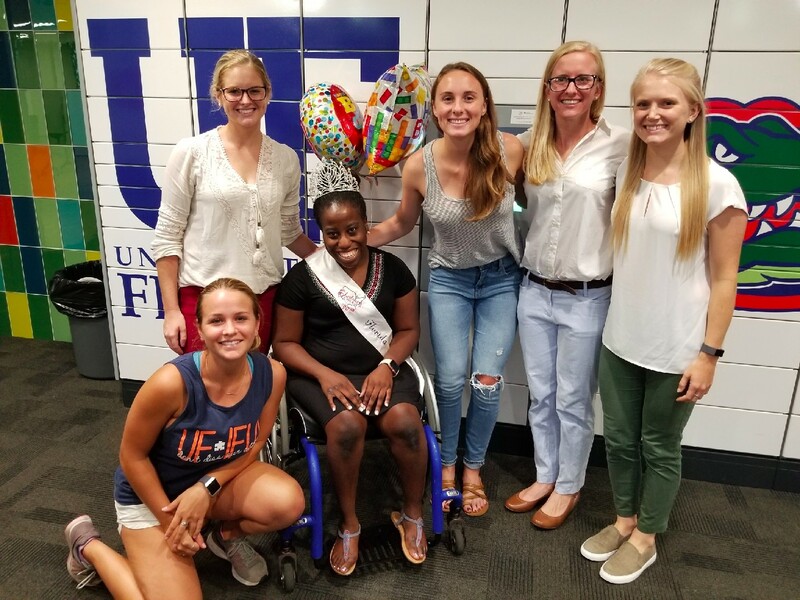 On Thursday, Sept. 6, Erin Waterman, a second-year Doctor of Physical Therapy student, gave the keynote speech at the inaugural Disability Advocacy Assembly, which was hosted by the University of Florida Disability Resource Center. With about 75 guests in attendance, the goal of this event was to provide insight and information about disability to students. Erin’s speech, Mountain Leg, addressed those topics and explained how disability is a form of diversity. Erin Waterman (pictured to the right) working with a child at Balance 180. Erin’s research on students with disabilities and her advocacy in the Gainesville community gave her the right perspective to give this keynote speech, as well as another speech in 2016 at the Equity and Diversity Conference. “My passion for working with people with disabilities stems from working with Dr. Christine Stopka out of the UF College of Health and Human Performance. Dr. Stopka was one of the first to show the effects of exercise on individuals with disabilities,” she said. Her passion to advocate for young people with disabilities led Erin to choose the UF DPT Program — particularly because of the program’s commitment to research, education, and service. Within the Rehabilitation Education Activity & Community Health (REACH) programs, DPT students participate in community engagement activities, enabling them to develop the necessary clinical leadership skills for when they graduate. 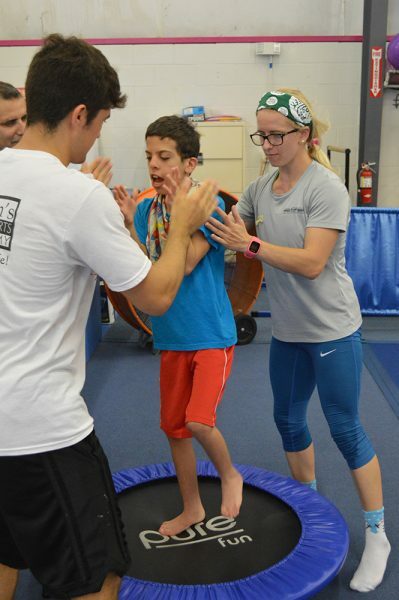 Erin currently serves as the co-leader for the Children on The Go REACH program, where she works with kids with developmental disabilities performing adaptive gymnastics at Balance 180.